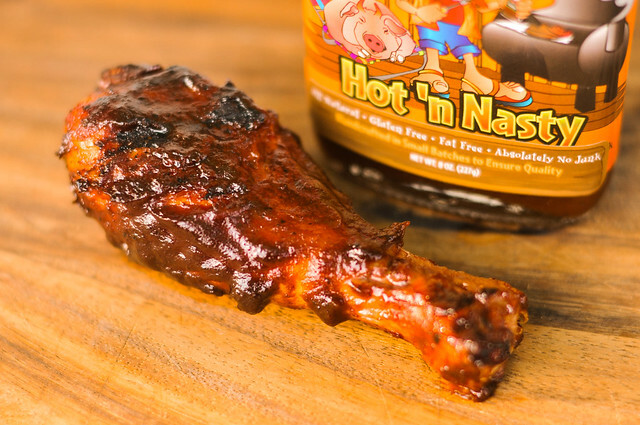 Living up to it's name, DennyMike's Hot 'n Nasty delivers immense heat against a great deep molasses and tomato barbecue sauce base to make it standout in the large field of sauces. A couple years ago, fans of the Meatwave Clair and Bill gifted me a bottle of DennyMike's Mesquit-O Madness Sauce. At the time, I had never heard or seen DennyMike's previously, but since then I've been noticing this sauce pop-up in Whole Foods stores everywhere I go. Since it's now more prolific and easily attainable, I thought I would give another bottle a try, this time around I picked the Hot 'n Nasty because of my love for spicy sauces. The DennyMike's story starts in Mexico of all places, where creator Dennis Michael Sherman had a Texan roommate who instilled a love for barbecue in Dennis with numerous trips across the border to great smokehouses. After burning the barbecue trail more throughly, DennyMike brought his love for smoked meats to Maine with a (now defunct) restaurant and a product line of four sauces and five rubs that are still going strong. This sauce has a deep, heavy handed aroma. A strong base of molasses and tomato mixes with pungent liquid smoke to create a robust, rather ubiquitous barbecue smell. The sweetness seemingly all comes from molasses, with the tomato being decidedly more acidic, like tomato paste. If you can get past the liquid smoke, Worcestershire is also heavily at play, but there's little hint of the heat the label promises. Weighing in just above the medium mark, this dark maroon sauce has a slightly textured look with very few discernible spices seen because of its opaqueness. From a suspended spoon, this sauce falls off in a few large globs, with a thick coating of sauce left clinging. 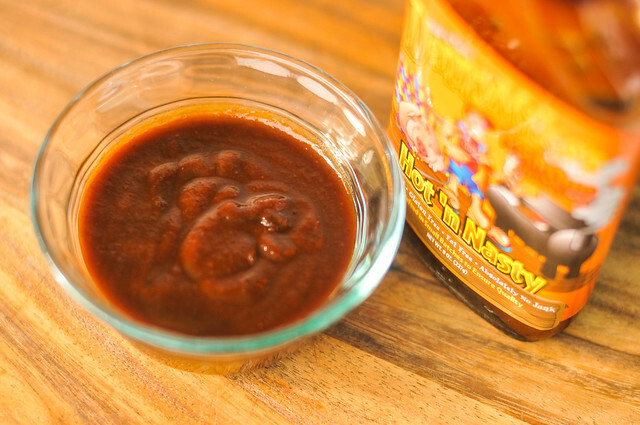 The sauce has a great progression of flavor, starting with a standard sweet and strong molasses and tomato flavor. Worcestershire and the tang of vinegar start to hit next, but the heat quickly takes hold. This spice starts mild, but builds and builds as it sits on the tongue to a mouth burning climax that left me with some heat induced hiccups. There's a strong smokiness that's tasted from start to finish, but all the other flavors is so strong, that the smoke never dominates and stays in a nice balance. The medium-thick sauce coated the chicken like a champ, baking in well and creating some nice caramelized crunchy spots without burning over direct heat. The sweetness of the sauce was pumped up after cooking, but still had the heavy flavors of molasses and tomato. The main attraction was the heat though, which got scaled back due to the extra sweetness to not be so intense as out of the jar, but enough to live up to its name. Overall the sauce was incredibly well balanced, with the right amounts of tang, heat, sweet, and smoke. So many "hot" barbecue sauces don't deliver on the heat, but DennyMike's Hot 'n Nasty does, and I immediately give it props for that. 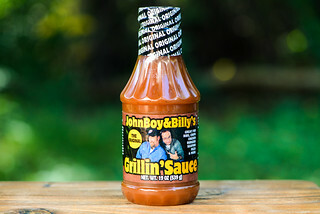 Moreover though, the sauce builds great layers of barbecue flavor that are very bold out of the jar and bit more balanced and slightly milder after being cooked. 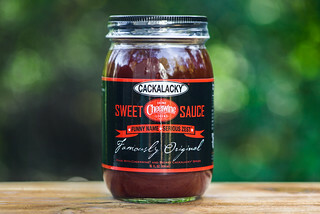 The mouth scorching heat may make this a good choice mainly for heat seekers when used as a condiment or dip, but it created tremendous flavor on the chicken, and with more sweetness and less spice, I think it's something almost anyone can enjoy. Those graphics ROCK. I'm seeing more and more sauces in the flask style. The cynic in me thinks it is because it helps them sell at a higher per ounce cost without making it look like you're getting less but the artist in me likes the aesthetics. We have enjoyed DennyMikes sauces and rubs for years up here in Maine. Very fresh, and can use in other recipes other than BBQ. 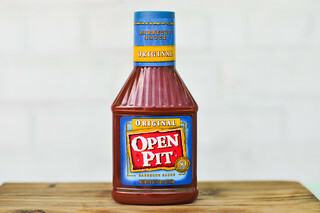 Try meatloaf or shepherds pie with this sauce.. nice.